Not a fan of corned beef? 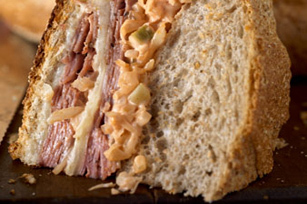 Try our Russian Reuben in the Round. It's served with slow-roasted roast beef in the shell of a round loaf of rye bread. Mix first 4 ingredients in medium bowl until blended. Add sauerkraut; mix lightly. Cut off top of bread loaf; remove bread from inside of loaf, leaving 1-inch-thick shell. Discard removed bread or reserve for another use. Fill bottom of loaf with layers of 2 cheese slices and half each of the meat and sauerkraut mixture. Repeat layers; cover with remaining cheese and top of loaf. Wrap in foil. Bake 45 min. or until heated through. Cut into wedges to serve. Prepare using a pumpernickel or sourdough round bread loaf and/or OSCAR MAYER Deli Fresh Bold Cracked Black Pepper Turkey Breast. To prepare as individual sandwiches, substitute 6 split kaiser rolls for the hollowed-out bread loaf. Fill with remaining ingredients.